The Prime Minister says the number of nurses is up by 3,000 since the last election, while a Labour MP says it's down by 2,500. It depends who you count, how you count them, and what time period you count from. Regular readers will be unsurprised to learn it all depends on who you count and how you count them. 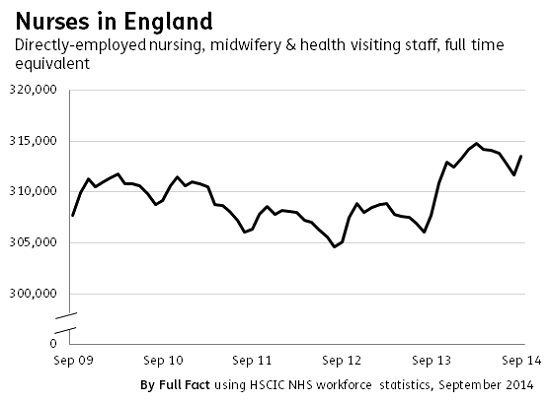 Between September 2010 and September 2014, the number of nurses (not including health visitors and midwives) in the English NHS fell by 2,300. That's using the 'headcount' measure of nurses (don't worry, we'll explain that later). This is the figure Mr Blenkinsop's office told us he was using. But if we start counting in May 2010 instead, and include those health visitors and midwives, and if we use another measure called the full-time equivalent, we end up with a rise of 2,700—not so far from the Prime Minister's 3,000. We've asked for confirmation of this. Mr Blenkinsop measured from September 2010 to September 2014, rather than going from the election in May 2010. Which makes sense because otherwise it's not a like for like comparison. Nurse numbers are usually higher in May than in September because there's a bit of a seasonal lull then before new nurses typically qualify. So if you compare May 2010 to September 2014, as Mr Cameron appears to have done, you end up including a mid-2010 drop in numbers that was pretty much unavoidable anyway. That means the Prime Minister's figures show a smaller rise in nurses than if he'd gone from September 2010 to September 2014. Mr Blenkinsop is not counting midwives or health visitors in his totals, while it appears that the Prime Minister is. Neither approach is obviously better. Health visitors, for instance, are qualified nurses or midwives who typically see patients in non-hospital settings such as the home or at GP surgeries. If you're interested in how well-staffed hospital wards are, then, you might want to exclude them. If you're looking for the total number of qualified nursing staff, you might not. About 2,000 health visitors and 1,500 midwives were added to the totals between September 2010 and September 2014, so the decision to count them or not has a big effect on the totals. The number of nurses, or the number of full-time nurses? Mr Blenkinsop has used the headcount measure of nurses. That's what it sounds like - the total number of individual nurses. There is another measure - that of the number of "full-time equivalent" (FTE) nurses. To calculate this the statisticians take into account the hours worked in order to give an idea of the level of staffing at a particular time. It looks like this may be the measure Mr Cameron's used. To indulge in an oversimplification; if one month you have a hundred nurses working full time hours and the next month they all work double that the headcount measure wouldn't change, but the FTE measure would double. The general trend you see under the two measures doesn't vary all that much. But in this case it turns out to have made a big difference. From September 2010 to September 2014 the headcount number of nurses (excluding midwives and health visitors) fell by 2,300 even while the numbers went up by about 600 according to the FTE measure.